Over the last couple of weeks I’ve posted bits of the Harry Potter birthday party I was planning for (and with) my 9-year-old. And since today is her actual birthday, it’s the perfect time to share this post. 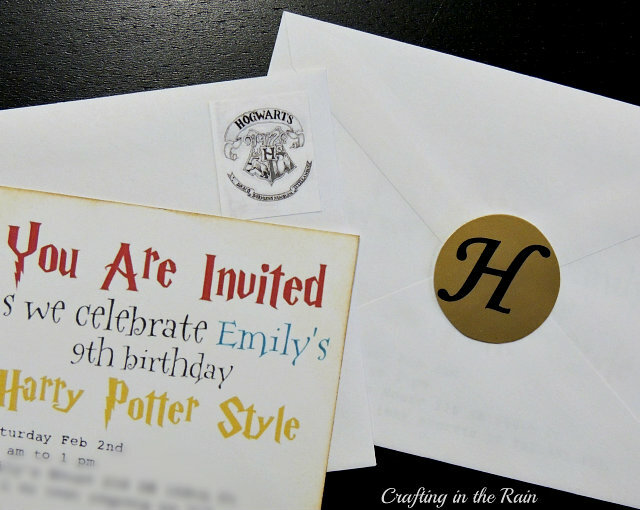 I downloaded a couple of different Harry Potter fonts and used them to create the wording on our invitation. I rubbed brown ink around the edges of the invitation and the edges of the envelopes. To make the Hogwarts “stamps” I found an image of the Hogwarts seal online and copied and resized in a word document, duplicating it several times and printing on white cardstock. Then I just had to cut them out and attach them with glue. On the back of the envelope I cut circles from gold paper (a punch would have been very handy here) and cut “H” from black vinyl to put in the center. This is a piece of red posterboard cut into a rectangle with gold duct tape down each edge. 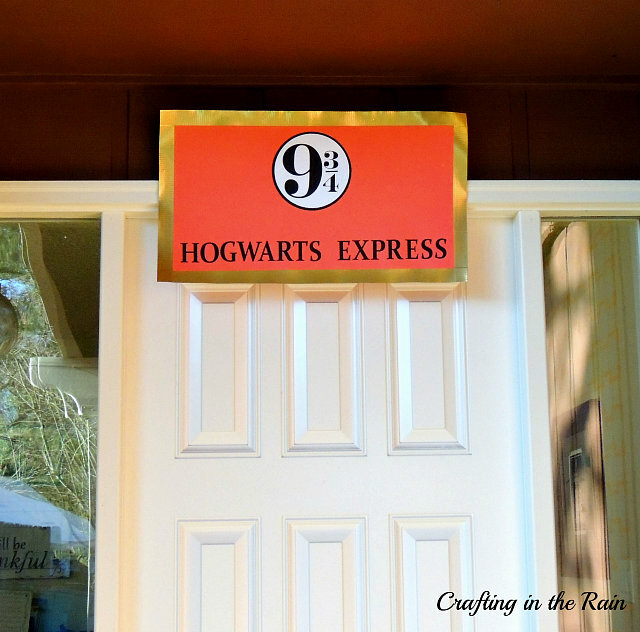 I used my Cougar to cut out the “Hogwarts Express” letters and the numbers in the middle. The Keep Calm sign, Happy Birthday and Great Hall, and quotes from the book, as well as all the food labels came from the wonderful Laurie at Gallamore West (thanks Laurie!) 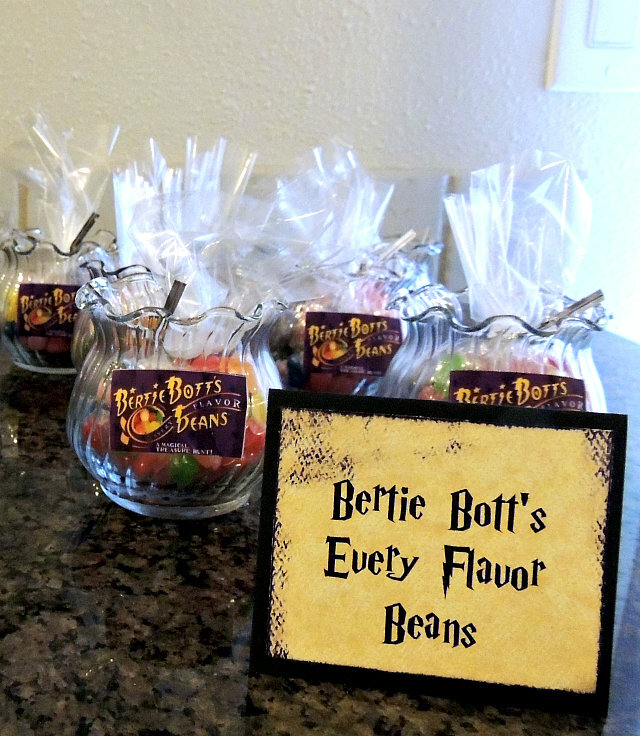 She had a Harry Potter party recently too and was so kind to send me all of these. 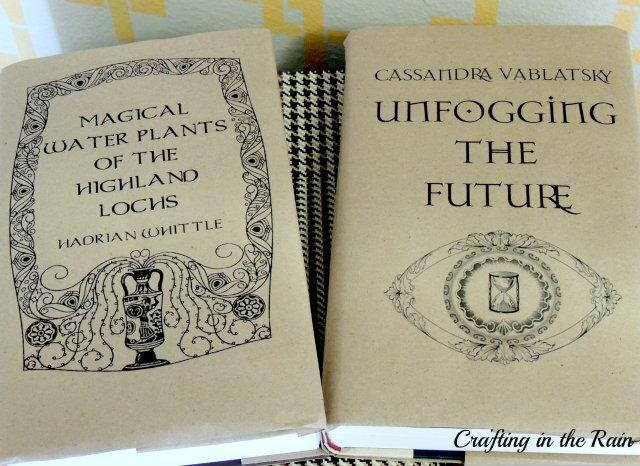 For these two texbooks, I taped some brown kraft paper onto a regular sheet of paper so I could run it through my printer (alone the brown paper was too flimsy and jammed my printer) I found the printable book covers at Until Wednesday Comes My books were bigger, so I wrapped the whole book in brown paper, then cut just the front cover part and attached it to the book front. They looked great! 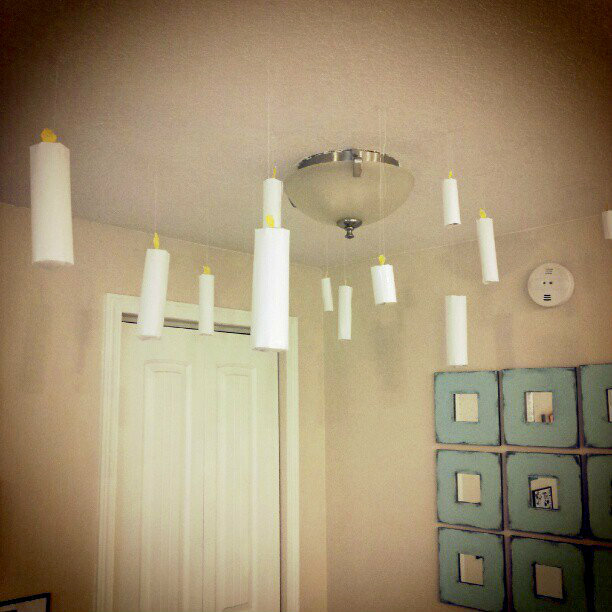 I made paper candles to hang from the ceiling over our table. 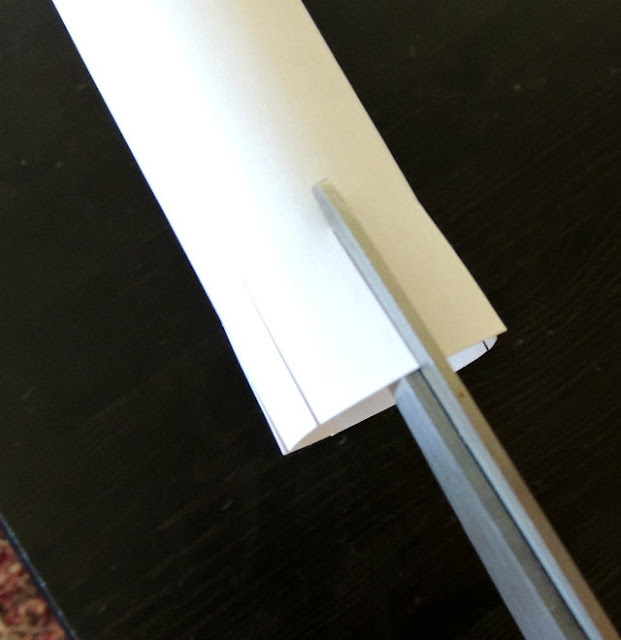 To make these, roll white printer paper into a tube and secure with tape. Cut slits in each end, then fold them all in on each other and tape again. I had planned on using bits of tissue paper for the flames, but didn’t have yellow. 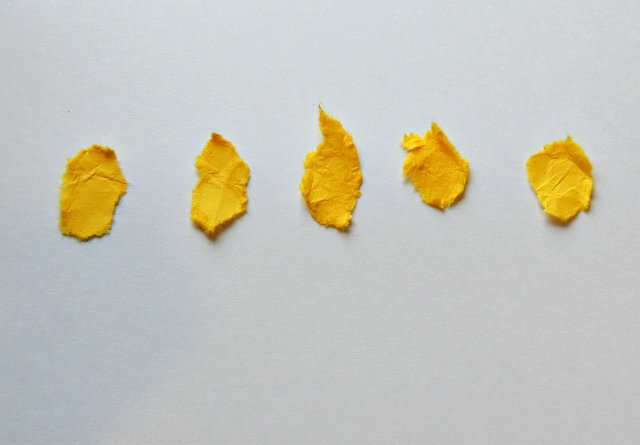 So I took some yellow construction paper, got it slightly damp, crumpled it up a few times and tore flame shapes out of it. Hot glue secured a flame to each candle top. When the glue was set, I wrapped thread several times around the flame then taped it to the ceiling. 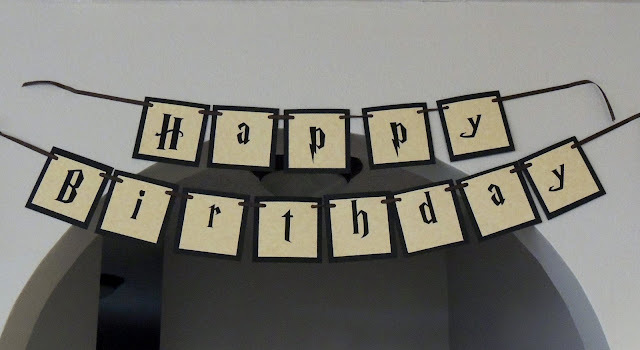 It would be awesome with invisible thread, but I’ve found it can be quite slippery and I didn’t want the knots to slip out and drop the candles. 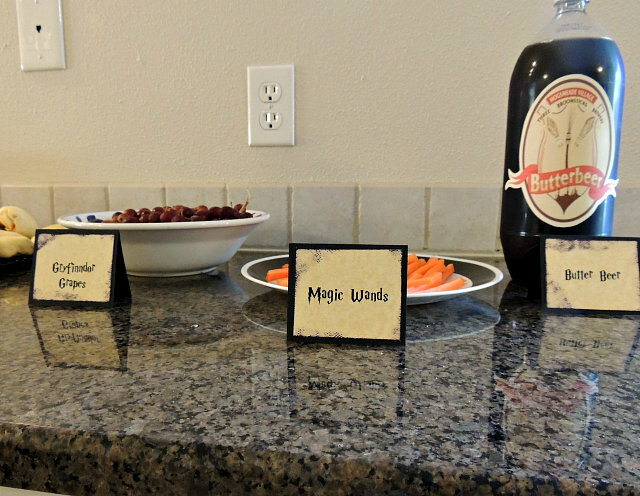 We served Potter pizza, Magic wands (carrot sticks) Gryffindor grapes and Butter beer. I’ve seen some fun butter beer recipes online with cream soda and butterscotch, but Emily likes root beer better than cream soda, so we stuck with that. Each of the kids got to make their own owl cupcake. 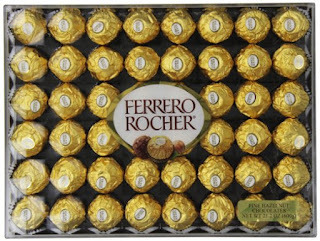 I didn’t take any pictures, but they were just like these from One Lovely Life only we used white frosting (more like Hedwig) and Reeces pieces instead of M&Ms, since there are more brown ones. I had kits made up already, so each kid got a bag with two oreo halves in it (the halves with the frosting still stuck on…I won’t tell you what happened to the other halves 😉 a candy corn and two Reeces pieces. Then they stuck everything together with frosting. 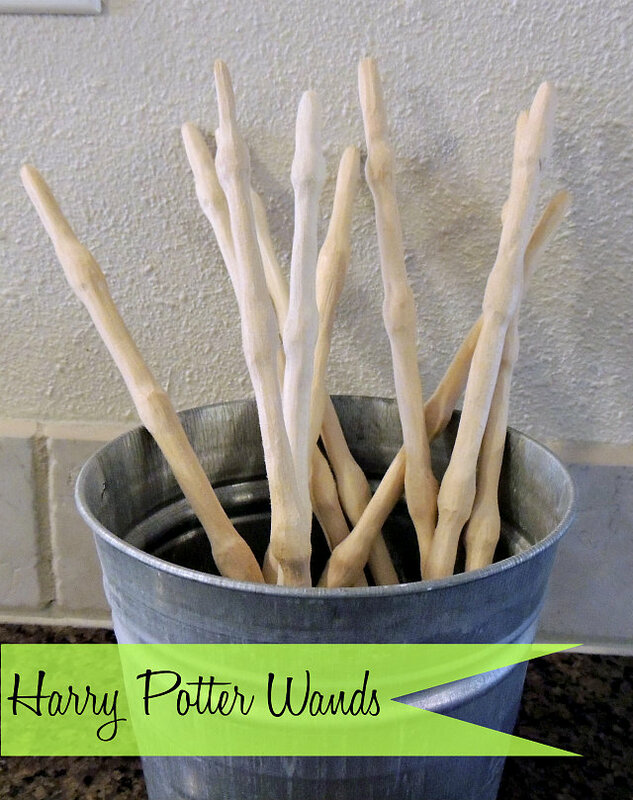 While guest were arriving, everyone got to paint their own wand. Dad was the hero here as he had shaped each of these wants out of a dowel using his Dremmel. Let me know if you want more information about these and I’ll get more details from him! If you‘ve seen any of our other parties, there’s a “pinning” game at each one. My kids love coming up with a version that fits their party. 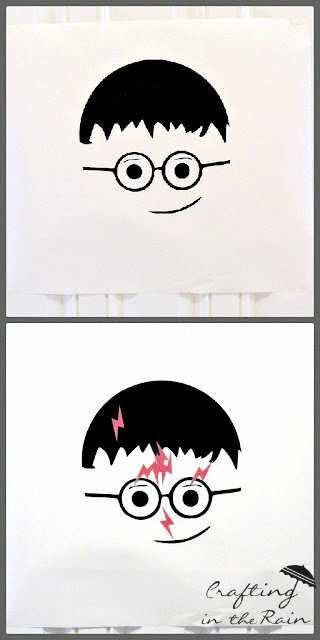 We stuck lightning scars on Harry’s face. 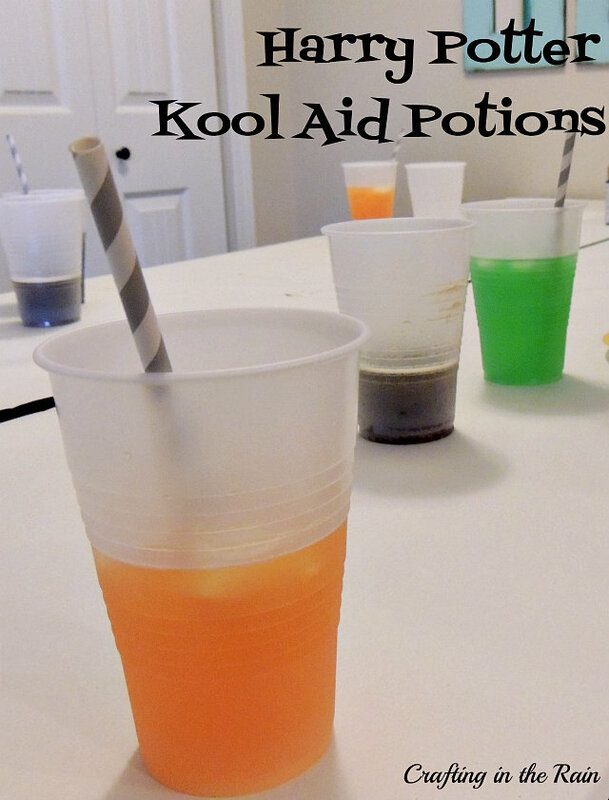 In separate baggies I mixed one cup of sugar with one packet of Kool Aid mix, making sure to use a few different colors of Kool Aid. Before the party I put 2 tablespoons of mix into plastic cups. 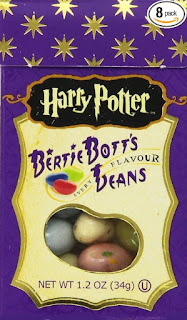 Just before our potions game I put a couple of ice cubes into each cup, to kind of cover up the mix. Then they poured 1 cup of cold water in and watched it change color. They each had a wand (straw) to mix it up with, then they could drink it with lunch. As each guest was going to go home, Emily took them to Honeydukes to pick up their cauldron of Bertie Botts Beans (just regular flavors though. 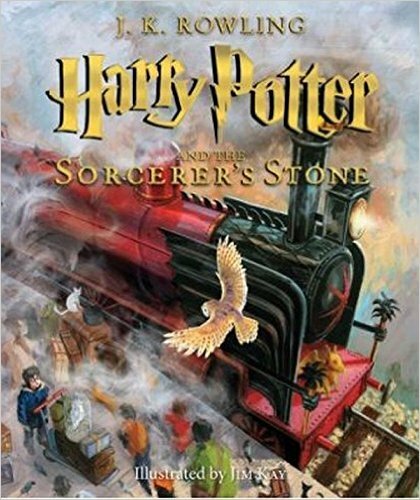 I know you can get the nasty ones online, but we thought that might be kind of mean) and their own golden snitch. 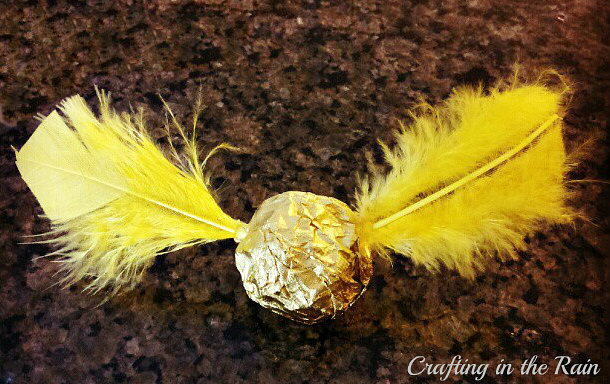 We’d seen versions made with white feathers or yellow paper wings glued onto a Ferrero Rocher, but we found yellow feathers at the craft store and knew they were perfect! 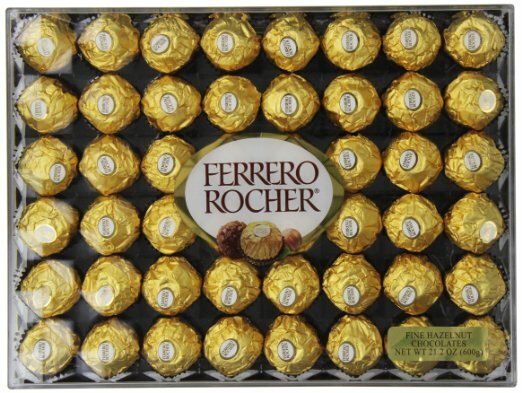 Hot glue held them on great and didn’t melt the candy inside. And there you have it! 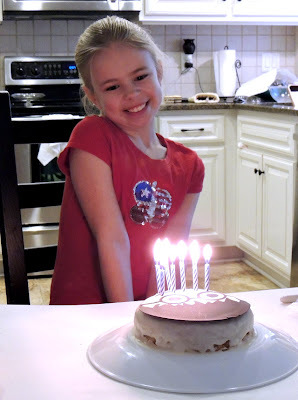 And we’ve reached the end of birthday season at our house. All 5 of our birthdays happen between October and February…which doesn’t sound so bad until you throw Thansgiving (the same week as 2 of the birthdays this year) and Christmas in there. 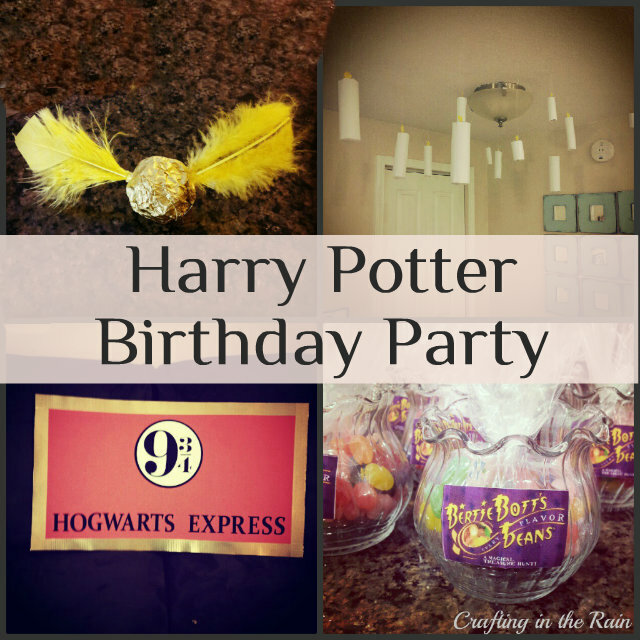 Thanks for sticking around to the bottom of this post, and if you have a Harry Potter party coming up in your future, I hope you can use some of these ideas! Be sure to check outs Laurie’s party, and this one too from Helping Little Hands for even more great ideas. Want the authentic flavors of Bertie Botts beans? Can I get instructions on pin the scar on Harry? ?